Reader’s Annotation: While her inner voice is clever, strong, and insightful, Melinda Sordino has no intention of speaking her thoughts aloud, even though her story needs to be told. Summary: Melinda Sordino realizes what happened to her at a party over the summer, but she has told no one. Now, she is ostracized at school, she has grown apart from her best friend, and she knows she probably will not want to talk even if she had someone to listen to her. The tremendous weight on 14-year-old Melinda’s shoulders seems to have claimed her voice. As she drifts through her freshman year of high school saying as little as possible, it is clear that Melinda needs to find her voice before she drowns in her own silence. Notes: A spot-on assessment of high school cliques, this is a gripping story how a young girl copes with assault. 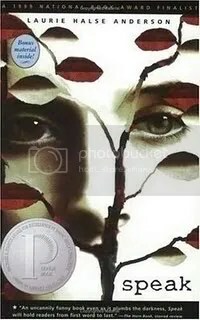 The novel is an ALA Printz Honor Book (2000), a 1999 National Book Award Finalist, and a Edgar Allan Poe Award Finalist.